Heroes have new character stats, items stats, and spell stats such that damage, armor, and HP/MP increase in new ways. It will be very hard to reach max damage or HP or MP or armor, etc. Every monster tweaked or changed. A vast majority of the monster AI has changed. Monsters are tough now, and should demand attention for victory. No more just holding down a button or casting your best spell. If a monster is human, it might have a little gold or items, but if not, the best you’ll get is dried meat. The only items that have not changed are those that cure ailments. Even then, the prices have changed. Every character has been changed in terms of stats. Relm has X-magic instead of Sketch, and is very feeble. Setzer has Jump instead of Slot, has good defense, can use all armor types, and can use all weapons better than everyone (and DragoonBoots are no longer obtained early in the game, so jump is much rarer). All characters are competitive in terms of usability. All Tools have been tweaked, 2 were removed because they did nothing for the game and couldn’t be edited (Chainsaw and AirAnchor). Tools are almost completely magic based. Runic is no longer gone after Celes chooses to use a new turn. 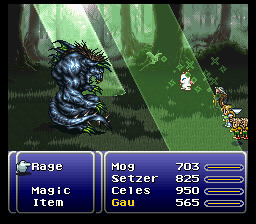 If Runic is used and has not absorbed a spell, it will continue to be in play and Celes may continue battle as normal. Blitzes were changed or tweaked. BumRush (now “Chi Strike”) is no longer super powerful because you learn it so early in the WoR. 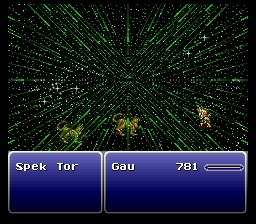 Sabin’s last skill is the most powerful magic spell, but it kills him everytime he casts it. His other attacks are physical. SwdTech skills were changed or tweaked. Instead of waiting for the slow bar, the selection bar moves faster and upon selecting your attack you may use other players while Cyan prepares his attack, which takes longer based on the selected SwdTech. His early Swdtech is mostly magic, and most of his later skills are physical damage, and it is all offensive. Much of the lores have been tweaked or changed. Almost every lore is unreflectable/unrunicable. Many have new graphics. There is still one lore spot being unused for now. Roulette was removed. All of the dance spells have been altered, many of them changed completely, and a good portion of them have new graphics. All dance moves are unreflectable/unrunicable. His most powerful three dances can be found in Darill’s Tomb, the outside of the Ancient Castle, and in Kefka’s Tower. Terra’s morph is now infinite but she incurs double damage and deals double damage, for physical and magic. All of the rages have changed. You will be able to find a superior attack/spell in rages at each level of the game. However, at present there is a chunk of the rages mimic their monsters to the point of being a bit boring (no Quasar/Goner rages). For the most part, rages don’t have skills that come from Dance or Lore. Throw now only ignores row, defense, and has 100% hit. Shadow will now never leave your party randomly at the end of battle. The colosseum has also changed. 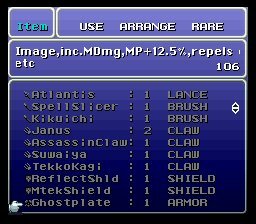 Every item wins another item (No Chupon-Elixirs anymore). By betting an item, you will usually be able to win a better item. The top tier items will only be able to be won by betting another top tier item, but almost every item should be winnable. These relics have been removed: Exp. Egg, sprint shoes, true knight, goggles, runningshoes, fake mustache, gale hairpin, mithril glove, moogle charm, charm bangle, so don’t go looking for them! Most relics have changed, of course. Slow/Haste effects have been doubled. Reflect is now much more powerful, and does not go away with time, and hard to remove. Jump has been nerfed, it gives 100% chance to hit and deals +50% damage. 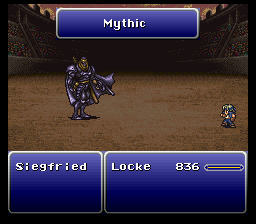 Also, the background music does not change when entering a fight, unless it is a boss. 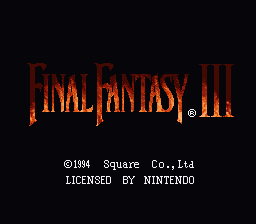 If you need more info than you could possibly want for this version, I have the excel sheet used to create this game, as well as a supplementary documents for easier reading attached.